The following information is replicated from the Whitby Gazette and heralds yet another ambitious plan for the William Riley. This time round the aim is to raise funds for the St Catherine's Hospice a very worthy cause. Whitby and district is being urged to get behind a mammoth fund-raising effort in which the historic Whitby lifeboat William Riley will be rowed along the Thames in a bid to raise thousands of pounds for charity. 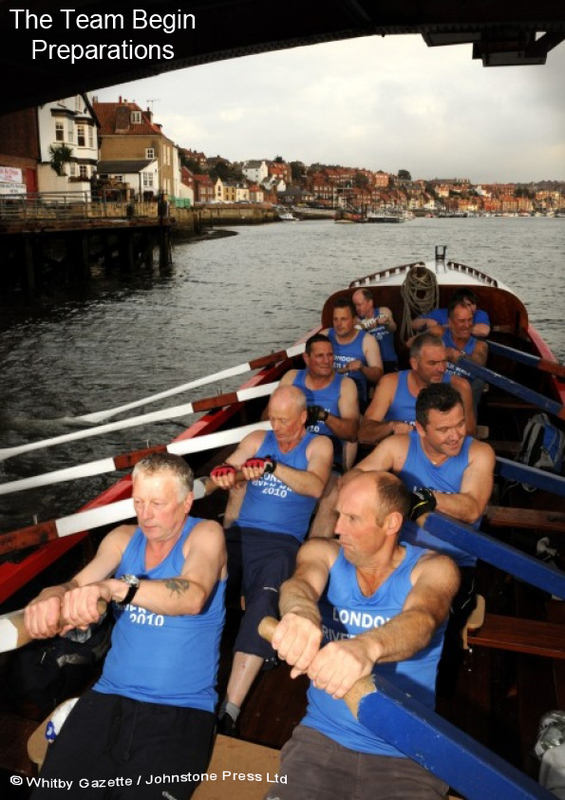 The 101-year-old vessel, which has been lovingly restored by volunteers, will be taken by a crew from the town's Fishermen's Rowing Club to compete in the prestigious 21-mile Great River Race – close to where she was first built. Raising funds for St Catherine's Hospice and the crew is hoping Whitby Gazette readers will rally round and sponsor them, while offering the chance for one donor to win a £50 cash prize. The 10 man crew of veterans – along with a coxswain and one regulation passenger – are in training for the epic boat race which has been running between the London Docklands and Richmond in Surrey since 1988 and has around 300 entries in various types of vessel. Teams from the Fishermen's club have competed every year and have won some of the top prizes, but it is the first year they have been able to take the William Riley, which has a long history of rescues in Whitby and was restored to its former glory three years ago. The training in the William Riley is different to other boats – the crew were not used to the short pull technique needed. Fishermen's club captain, Barry Brown, said it is the first year the Fishermen's crew has raised money for St Catherine's Hospice and are pleased to be able to support the local cause. He said: "We have been all over the place, but we will get used to it. "We have been putting in practice for two hours at a time three times a week. "St Catherine's touches a lot of people locally and everyone knows the great work that they do." The event has cost around £500 to enter, along with the expense of transporting the lifeboat to London and towing it to the starting point. He added: "We are appealing to any companies or individuals to help towards costs or donate to this charity, we really want to raise as much money as possible." Fund-raisers from St Catherine's, which operates a day hospice in Whitby alongside their main Scarborough centre, are delighted with the support offered and have helped out by giving them rowing vests and a flag emblazoned with the hospice's logo, helping to commemorate 25 years of their vital work. Penny Campbell, fund-raising co-ordinator for the hospice, said: "It is great to see people going the extra mile to support us. They are putting in a lot of time and effort, and it is not a simple task. "It is just a shame for us we cannot all go down to London and cheer them on from the shore, but the pictures will be lovely to see." Sponsors also have the chance to win a £50 prize when they guess the time the William Riley will take to complete the course, with the nearest time, down to the second, scooping the cash. Each member of the crew has a sponsorship form or donations can be given to John and Christine Scott at The Board Inn in Church Street and at the Fishermen's Rowing Club. You can also call Barry Brown on (01947) 601659. From its debut in 1988, The Great River Race now has firmly established itself in the sporting calendar to such an extent that experienced crews describe it as a classic event - the one they all want to win. And with its intriguing mix of colour, spectacle, intense competition and casual fun, it combines all the ingredients that made London's 'other' marathon such a success; but with the addition of dozens of great photo opportunities as the race progresses from the striking Docklands skyline at the start, through central London until it reaches its semi-rural Surrey conclusion. The Great River Race attracts both the true racer and the leisure rower and, in developing into 'London's River Marathon', is doing for rowing what the 'Road Marathon' did for running. Not surprising when the course is a grueling 21 miles from London Docklands to Richmond as such a high profile event the Thames Great River Race has its own website. I have just added a new page that details the success of the William Riley's involvement in the Great River Race with downloadable files detailing the results for all the vessels that took part in this amazing adventure.